Atletico Madrid marks its Territory with new Third Kit by Nike! 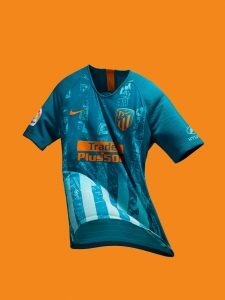 Home / Business of Football / Kits / Atletico Madrid marks its Territory with new Third Kit by Nike! The Fountain of Neptune, found at the centre of Madrid Plaza, is the metaphorical focal point of LaLiga giants Atlético de Madrid’s new third kit. The striking two-tone blue shirt pays a twofold tribute to the synergy among the club, its supporters and the Spanish capital: First, by representing the water that flows from the fountain, around which fans gather to celebrate victories. And second, through its orange detailing, reminiscent of the way the city’s sunshine bounces off Neptune’s trident. The base of the design is an aerial map of Madrid, which is distorted through the famous stripes of the Atlético jersey. This marks the location of the fountain, and further grounds the club to its unique home city. Previous Football facilities in India tempted me, admits Bhutan’s Chencho Gyeltshen! Next MPL-7: Electric Veng FC shock & conquer Aizawl FC again!